Retreat pricing includes taxes and gratuities. Lace up your boots and get to the ranch to experience the magic of animals and the fiber milling process. If you love animals, fiber, knitting and the Colorado Rockies... this retreat is for you! 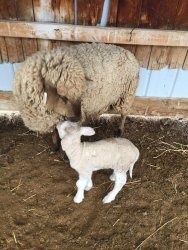 Lorrae and Lewis Moon welcome you all onto there ranch where the wool is sustainable and their carbon footprint is gentle on our planet. Get a first-hand look at what goes into creating 100% US wool. Then pick up your needles and feel the joy of working with the fiber that is truly a labor of love. The Homegrown Hat has been designed specifically for the retreat and will be the retreat Knit-A-Long (KAL). An amazing swag bag, plus a few extra surprises! A weekend away with plenty of time to knit and get to know each other! Bring a friend and share this knitting retreat. Retreat classes are designed to be fun for every level of knitter, advanced skills are not necessary. You will participate in ALL classes. The only thing you need to bring with you are your needles and the desire to explore this mill adventure. Take a Mill tour and Fiber 101 class from Loorae and Lewis Moon. Learn about ranch sustainable practices, visit the animals and learn about the different breeds, and help process some yarn! Carol will teach Mosaic Knitting technique and will discuss different colorwork techniques. We will learn this beginner level knitting technique using the Retreat KAL project kit. The class will focus on chart reading techniques and will help identify next projects to use the mosaic technique. Learn about mortar and how to prep yarn for dying. Then create yarn that is uniquely your colorway. Be inspired by Craig, Colorado's big open sky and its unique charm. Celeste will teach steeking technique. Learn how to prep your knitting for cutting and discuss next steps for knitting projects that involve steeking, what wool to use and when to use the technique. The Hampton Inn & Suites has generously offered retreat participants a discounted rate of $79 per room, regardless of occupancy. Availability is limited, please click the link below to make your reservations early to ensure Retreat pricing. The Hampton is relatively new and offers guest a comfortable, modern experience. You will enjoy a complimentary hearty breakfast buffet to fuel you for your day on the ranch. The dining area has plenty of comfy seating where you can sit, knit and visit. Please read the following carefully because by booking your place, you agree to the retreat terms and cancellation policy. The 22 places will be made available on a first-come first-serve basis. You agree to pay an initial deposit of $75 to secure your place. The first $75 will be used as a reservation fee to save your spot and once the fee is paid we will send instructions on how to pay the remainder of the retreat balance. This $75 is non-refundable regardless of life circumstances so please make sure you can commit to the retreat dates prior to booking your place. A waiting list will be maintained once all spots are filled. Should we have a replacement, a registrant is unable to attend, and the cancellation is received before April 1st, 2019, a full refund less the $75 registration fee will be available. No refunds will be available after April 1st, 2019. Our hosts Yampa Valley Fiberworks requests we show great respect for their property while we are on-site and that each individual take responsibility for their safety and well-being.